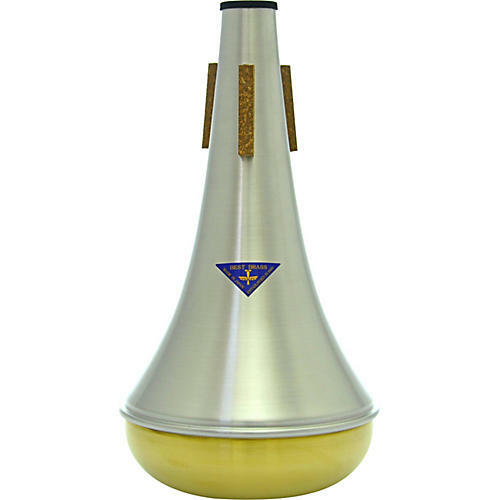 A straight mute is one of the most essential accessories for brass instrumentalists, and it is absolutely necessary in classical and big band music. Generally, conic straight mute are longer than a curved-shape straight mute. The length is needed to keep the intonation of low registers, but it protrudes from the bell and tends to be visually disturbing. On the other hand, most curved-shape straight mutes have good intonation but tend to be thin-sounding. The Best Brass BB straight mute for bass trombone solves this conundrum. BEST BRASS Straight has a curved shape but achieves precise pitch and intonation. The beautiful shape is based on the result of having focused on sound quality. Apart from its fantastic sound in a soloing context, its splendid sound doesn't get buried in a band mix due to its clear total core. Three kinds of materials: Aluminum, Copper, Brass, are adopted as a bottom part, and that should broaden a player's choice and achieve a more colorful music presentation. This one features a brass bottom.